My friend Ruth from Flixchatter.net has created a very fun blogathon that this post is a part of. Highlighting the unsung heroes of scenes in movies that had an impact or an impression on the viewer! This is quite a great topic and a fun choice for such an exquisite blogathon. The blogathon officially launches on Monday, October 1! Highlight a performance from an actor [classics or contemporary] in a supporting role or cameo, it can be as short as five-minutes, as long as that particular scene is memorable and/or makes an impression on you. I’d ask that you choose a performance that was NOT nominated for major awards and as much as possible choose an actor that isn’t generally well-known, the more obscure the better! You could choose to do a write-up of ONE or several (up to three to keep things from being too long) performances. It’s up to you how long you’d like it to be, I don’t want to restrict you if you are passionate about a particular scene, but I think 150 – 400 words is ideal. Write why you love that particular scene and how it’s touched you, be as specific as you’d like to be and you could even elaborate on the actor or share some trivia about the movie in relation to that performance. For this segment, I chose to highlight the small role, yet big performance, of two performers: Maïwenn Le Besco and Inva Mula. Maïwenn Le Besco and Inva Mula together provided the memorable performance of Diva Plavalaguna in The Fifth Element. The Fifth Element contains some very memorable performances. From a semi-bald power-hungry Gary Oldman, to an overly outspoken and outlandish Chris Tucker, to the exotic-looking multi-pass carrying Milla Jovovich and more, The Fifth Element is a colorful creation of director Luc Besson whose characters are just as colorful. One of the film’s most memorable, and…um, colorful characters is none other than the special blue Diva Plavalaguna! In case you did not realize, however, the person who acted out the beautiful and iconic operatic performance was not the same person who gorgeously sang it. It was indeed a 2-part performance by an actor and a singer. Actor: Maïwenn Le Besco, born in France on April 17, 1976, is both a French actress and film director who, during the filming of The Fifth Element, was in a marital relationship with director Luc Besson. The gorgeous Maïwenn Le Besco donned the blue outfit of the prestigious opera diva in her second major release (following her appearance in Léon: The Professional -yet another Luc Besson film). During The Fifth Element, though, Luc Besson left her for the film’s star Milla Jovovich, and Maïwenn lost her motivation for acting for several years. She has yet to return to so “big” a role as the blue diva in Besson and Jovovich’s The Fifth Element but she does continue to act and direct. Her biggest claim to fame, however, continues to be that of the beautifully breathtaking Diva Plavalaguna. Singer: Inva Mula, born in 1963, is the Albanian soprano operatic voice who performed both the aria (“Oh, giusto cielo!…Il dolce suono” from Gaetano Donizetti’s “Lucia di Lammermoor”) and the famous “Diva Dance” song in the film. Besson was introduced to her after realizing that earlier recordings of the aria were not of the clearest quality for use on a soundtrack for film. It is her voice that is heard during the performance. Many have tried to emulate the entire piece that extends over so many octaves, however, she herself did not even sing it as it is shown. Several of the notes are nigh impossible to sing in the fashion in which it was written, so Mula recorded many of the notes individually which were then pieced together to provide the unnatural/extraterrestrial progression of notes heard so beautifully in the moving scene. Watch this wonderful informative video about the making of Diva Plavalaguna of The Fifth Element. The first time I watched the scene I was enthralled by it. It is a scene that is both as eccentric as the movie and its characters and as different from the rest of the scenes in the movie as the film is itself from others in the genre. It’s a turning point in the film in which Korbin Dallas (Willis) becomes even further vested and believing in the importance of the events transpiring around him. Each time the scene is on, all else seems to cease to matter, including time itself. Such a captivating sequence so beautifully done that is easily one of the biggest performances of all in Luc Besson’s widely acclaimed scifi flick. Both of the women played a big part in making the small role of Diva Plavalaguna such a BIG deal. And they did it in a way that forever is remembered by fans and haters of the film alike. 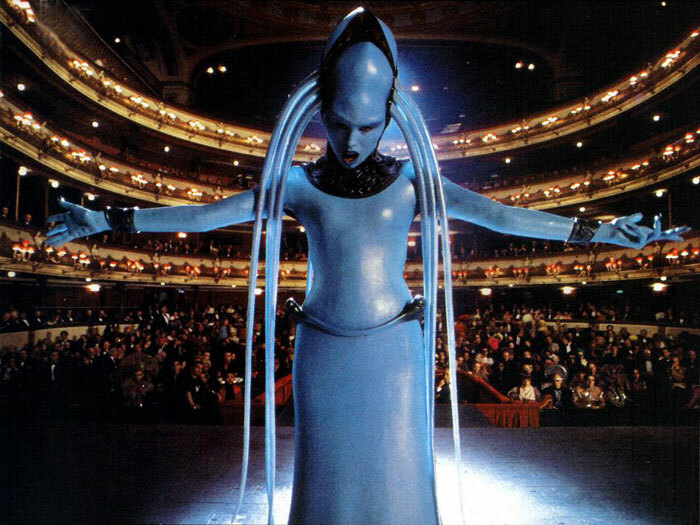 Three things often are remembered about The Fifth Element: (1) Ruby Rohd, (2) Leeloo’s orange hair, and (3) the blue diva with the gorgeous song and dance! It is the latter that I pay homage to today. Enjoy the scene below as you watch two small roles in big performances of The Fifth Element by Maïwenn Le Besco and Inva Mula. Thanks for reading. Happy watching! This is a very exciting blogathon man and you have chosen a great performance(s). I was wracking my brains and lots of options came to mind but I have to admit that this wasn’t one of them. Its a gret moment in the film and an excellent choice. Mark! Thank you for stopping by and chiming in. I can’t wait to see everyone’s choices and see who you picked. Great choice T, I agree, the blue diva moment is wonderful, I especially like it when it goes into the dance part 🙂 one of those movies I think I watched on TV at least 5 times! Diana. So nice to have you visit. Thank you. Also glad to see your enjoyment of the Fifth Element. I love it too! Thanks Tim. One of my fave movies for sure. Wow, I’m glad you went with a really obscure performer here, T. You even found the clips from the movie, how awesome! It’s been a while since I saw this movie, a rewatch is due I think 🙂 Thanks for taking part, my friend! Thanks Ruth. Thank you so much for thinking of such a fun event for a blogathon. I really enjoyed putting this together. I haven’t seen this movie yet…I will remember them when I see the movie. Thanks Nov. How was your weekend? I hope you get to see The Fifth Element sometime. I enjoy it…and the colors are so vivid! I haven’t seen The Fifth Element, and it looks kind of awesome. 🙂 How often does one get to see a movie with a blue diva? Great post!